Cream Nut Crunchy Peanut Butter...this new classic crunchy peanut butter is made with only two ingredients, peanuts & sea salt. Cream-nut crunchy peanut butter includes flavorful chunks of Virginia peanuts & boasts a traditional deep-roasted peanut flavor. In Cream-nut crunchy peanut butter there are no added preservatives, sugars, or artificial colors. 84 years & still crafted on lovingly preserved vintage machinery!!! Use with your favorite jam to make the most irresistible Peanut Butter & Jelly sandwich, or in a batch of crunchy peanut butter cookies that must be tasted to be believed...simply enjoy!!! 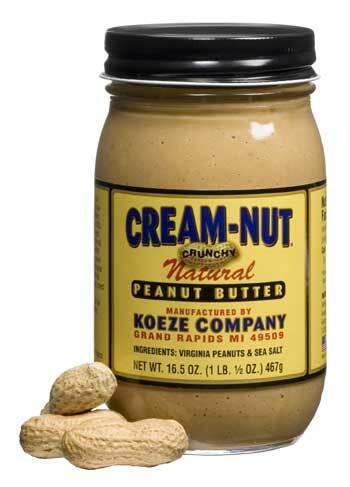 Koeze Cream-Nut Crunchy Peanut Butter.